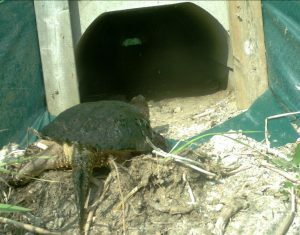 A Snapping Turtle enters one of the four small culverts under the Causeway. Two more small culverts and one large aquatic culvert will be installed this fall, bringing the total number to 12 culverts under the 3.6-kilometer road. Port Rowan, Sept 29, 2016 — The Long Point Causeway Improvement Project is slated for completion this fall thanks to funding from Environment Canada, the Ontario Ministry of Natural Resources and the US National Fish and Wildlife Foundation (NFWF). The Project is a community-based initiative that began 10 years ago as of next month. The planned work includes the installation of up to 1,800 meters of exclusion fencing and two of small terrestrial culverts along the Causeway north of Big Creek. This construction will be funded with $156,000 from Ontario’s Species at Risk Stewardship Fund and another $135,000 from Environment Canada’s Habitat Stewardship Program for Species at Risk. With this new funding, the Long Point Causeway Improvement Project Committee (LPCIPC), under the auspices of the Long Point World Biosphere Reserve Foundation, has raised $2,744,000 for this project to date. The LPCIPC appreciates the financial support of Norfolk County which has contributed about $65,000, about two and a half per cent of the total. Other work to be completed this fall includes the installation of a second large aquatic culvert under a contract awarded by the County last year to Bre-Ex Construction Inc., of London. This culvert will be located at the north end of the Causeway. As well, local dredging contractor Jim Granger has been retained to excavate connecting channels from the aquatic culverts to open water areas within the Big Creek Marsh. The $350,000 in funding for this additional work and related activities is provided by Environment Canada’s National Wetlands Conservation Fund and the US National Fish and Wildlife Foundation’s Sustain Our Great Lakes initiative. Local contractor Steve Armstrong and his crew, who have installed and maintained all of the exclusion fencing since 2008, will also construct the new fencing north of Big Creek. In other good news, the Project recorded a reduction in reptile road mortality of almost 80 per cent in 2015. Only 53 turtles and snakes were found killed by vehicles on the road, compared to 248 in 2008 when first fencing was installed. Similar results have been recorded so far this summer. “This citizen-initiated project has promoted Norfolk County as a recognized leader in the science and practices of road ecology and sustaining biodiversity. The LPCIPC has raised nearly $3 million that has been used to create employment and purchase goods and services in this community whenever possible. Our success in significantly reducing the annual slaughter of turtles and snakes on the Causeway has drawn positive comments from both local residents and visitors to the area”. The Long Point Causeway Improvement Project is managed by a steering Committee comprised of representatives from 12 government agencies and local organizations and several individuals well-known in the community. The LPCIPC receives financial and administrative support from the Long Point World Biosphere Reserve Foundation, which has promoted research, monitoring, education and projects that support the goals of conservation and sustainable use in the Biosphere Reserve since 1986.